Michael didn't stay very long in Houston, I wish he had though. I liked the way he played and I really liked that he was a native Houstonian. 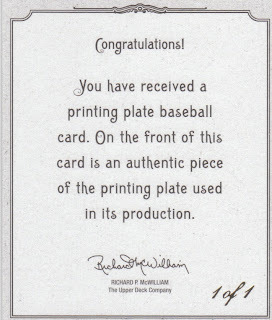 As for the cards, I think it's cool to have a plate and the card together, especially when it's an auto. I do wonder though, couldn't they have gotten Michael to autograph the plate as well? Maybe that's just a more recent thing. Anyways, I do find it interesting that on the plate they spelled Masterpieces correctly whereas they misspelled it on all the actual signature borders. Anyways, these cards are in the "permanent" collection, although since he wasn't in Houston long, they may become trade/sales fodder in a while. What do you think? When a player is traded after a short stint and he isn't one of your big player collections, do you hold onto hits like these? How long? Do the cards instantly become less valuable to you or do they still hold their value? Just curious how everyone manages their player collections. Have a great day! Come back tonight to see the video box break of the first box!!!! I'm more of a team collector than a player collector although I do have some player collections. I keep 'em if their Rangers. For me it depends on the player and the impact that they had on me while on the team. For example, Edwin Jackson wasn't on the D-Backs very long, but he did pitch a no-hitter for them, so I'm interested in his D-Backs cards. As a Cardinals fan, my Pujols collection will now be based mainly on (Cardinals) base cards and inserts, I'm not really going to pursue the g/u anymore. If I pull a Pujols-Cardinals hit out of an older product, I'll hold on to it; but I will have no problem letting go of a Pujols-Angels hit. On players who haven't always been with the organization, it honestly depends on who the player is. I have a Carpenter, Holliday, and Westbrook hits from times when none of these players were Cardinals. The Westbrook I will eventually part with, the Carpenter rookie auto I will probably keep forever if he ends his career with the Cardinals; and the Holliday will be held onto for an undetermined period of time based on how the rest of his career goes. Sorry for the repost, felt like I could clarify a few things a little better. 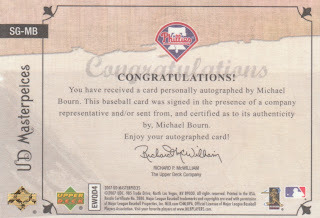 I bought that Bourne auto for less than $2 recently at COMC! First off... great cards, great post, & great question. Okay... now for my response. I've changed over the years. Two years ago, I wanted every single autograph and relic card if they were pictured in my team's uniform. But these days... my PC is changing... due to lack of space. 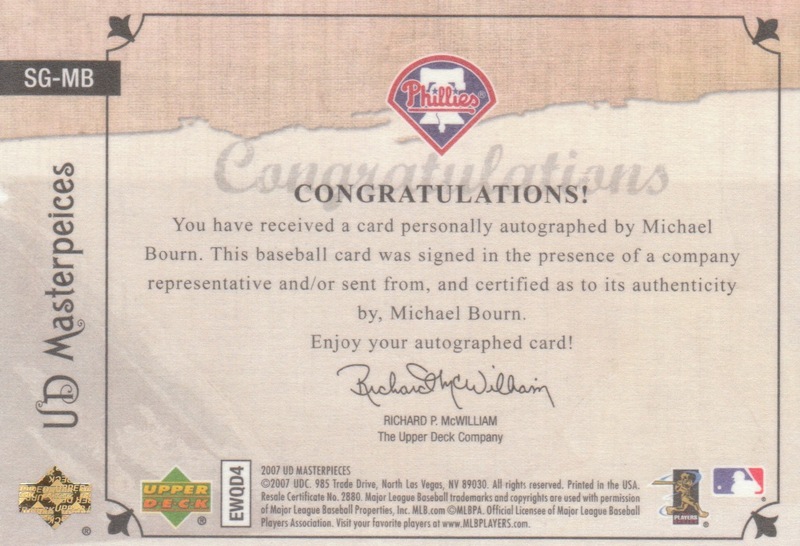 If Bourne was on the A's or Padres (for a single season), I'd want one of his autographs & that'd be enough for me. In order for me to want to collect multiples these days, they have to be favorite players or hometown heroes... just don't have the space to collect multiples of everyone. I'm not sure yet. One of the first hits I ever had was a Papelbon jersey. He's also the first one of any of my hits to change teams. Given what he's done for the team as a whole, and the seasons he spent there, I'll probably keep the card. It hasn't decreased in value in my mind. Same thing goes for most of my others. If David Ortiz had changed teams for example, I don't think I would have dumped any of the hits I have for him. On the flip side, I'm a team collector and not a player collector, so if I get a Papelbon card next year, it would have to be some crazy 1/1 thing for me to hold on to it. For example, I've got a Coco Crisp and a Jason Bay relic from non-Boston teams and I'm not interested in keeping either one. I guess, if the player makes an impact, or a personal connection in the hearts/minds/whatever of the fans (or me personally), it would be more likely that I'm interested in their cards. 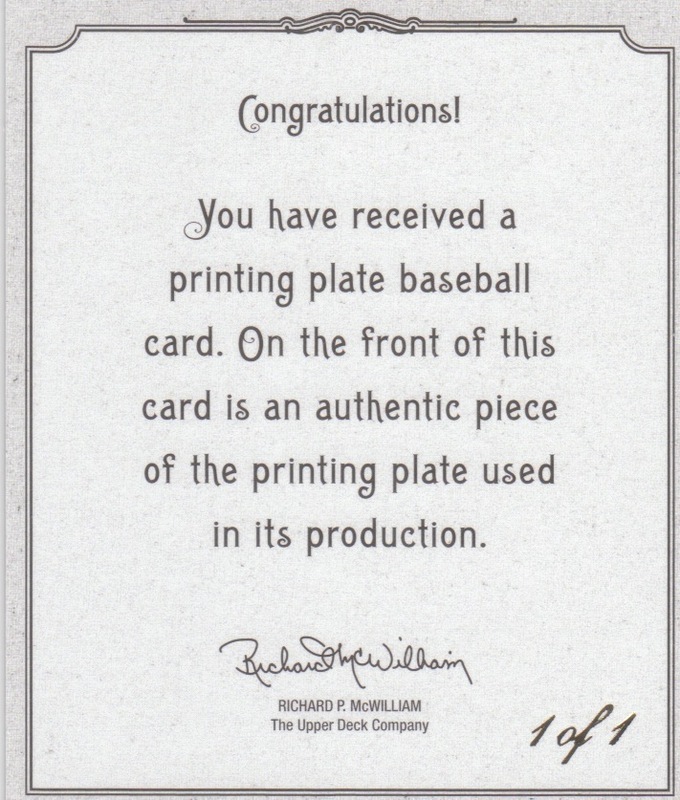 So, folks like Jason Varitek and Tim Wakefield might be really high on my interest, but really low on collectors value. i'm a player collector - but even if you played for the team a short time, it depends on the impact on the team, or if the player was involved in some sweet game memories. it also matters if the player was a jerk (IMHO). ex. j.d. drew - i could not care less about his cards. If it's something I like, I keep it. Simple as that for me.